I'm proud to be part of the fourth (!) 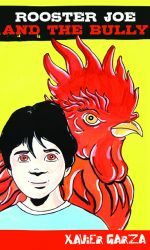 Multicultural Book Day, and to offer a middle grade book provided by Arte Público Press--Rooster Joe and the Bully/El Galo Joe Y El Abusõn, by Xavier Garz. The story reads in English from one side of the book, and in Spanish from the other. Joe loves to draw roosters, and he's gotten pretty good at them! When his art teacher at school sees his work, she encourages him to paint as well as draw, opening up new possibilities and dreams for him. His grandpa Jessie's a famous painter, and happy to help teach him too. And then he crosses paths with Kiki, a classmate from fourth grade, who's now really cute and friendly, and who seems to like him..... But things aren't all good. When Joe sticks up for Luis, who's being bullied by the biggest, meanest kid of the middle school and his henchmen, Joe becomes a target himself. Turns out that Grandpa Jessie can help Joe with more than painting, and his advice is pretty spot on. "All it take is one person, Joe," says Grandpa Jessie. "One person?" I ask him. "But what could one person possibly do?" So Joe draws on all the strength and fierceness of the roosters he loves to draw and paint, and stands up to the bullies. And other kids come to stand with him, becoming something bigger and stronger than the bullies could cope with. Joe's feelings are shown in a way that will resonate with the target audience, and kids will cheer for him as he takes his stand. It's a quick read, only 64 pages, and the story is pretty straightforward, so Upper Elementary school kids (4th graders) would have no problem reading it. Garzo's bold black and white illustration add pizzazz to the somewhat formulaic story. Head over to the Multicultural Children's Book Day links page, for a whole slew of reviews! About Multicultural Children’s Book DayMulticultural Children’s Book Day 2017 (1/27/17) is its fourth year and was founded by Valarie Budayr from Jump Into A Book and Mia Wenjen from PragmaticMom. Our mission is to raise awareness on the ongoing need to include kid’s books that celebrate diversity in home and school bookshelves while also working diligently to get more of these types of books into the hands of young readers, parents and educators.